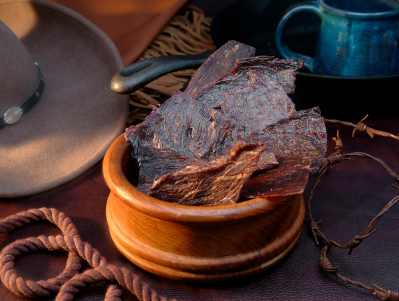 I don’t know very many dads who don’t like beef jerky. It’s one of those foods I never would have tried without some paternal encouragement (right up there with those big gross looking turkey legs at the fair!) I love when I can skip the convenience store artificial version of food and make something myself, and around here, we love nothing more than to DIY on gift giving holidays. Cheers to you, Dad! Place the beef in a 1 gallon zip-lock bag. Combine the soy sauce & brown sugar until sugar is dissolved and pour into the bag over the beef. Seal bag and place in refrigerator to marinate at least 4 hours or overnight. Every 2 hours or so, turn strips over and rearrange till they are completely dark brown and dry. The volume will have shrunk by almost one half of the amount of meat you started with. 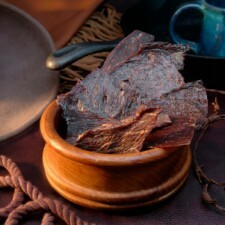 When jerky is completely dried, lay out in a single layer on paper towels to cool completely. A good way to check is to take a test piece and bend it. It should *snap* right apart! Store in zip lock bags in the fridge if keeping for more than a few days. Will keep for weeks when dried thoroughly and keep refrigerated. Eat within 3-4 days if not refrigerated. Get your coconut oil ready! Come back on Sunday to learn how to shine your dad’s shoes for Father’s Day!